1. 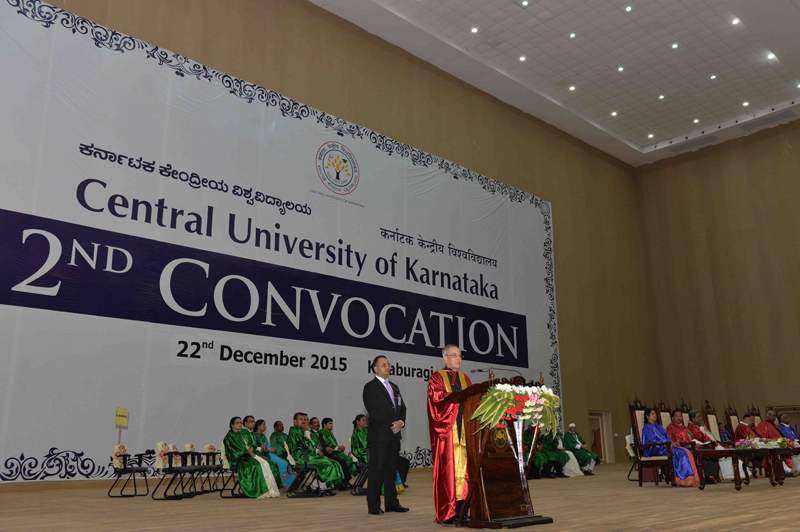 I am happy to be here today to attend the second annual convocation of the Central University of Karnataka. It is one of the sixteen central universities started in 2009. These universities were mostly established in the backward regions of the country to make higher education more accessible to the people. 2. Karnataka is a historical land marked by its multi-cultural, multi-ethnic and multi-lingual nature. Buddhism, Jainism,Veera-shaivism orLingayitismand Islam have flourished here. TheVachana Movement, Sufi saints, Keertanakarasand theThatva Padakaaras have shaped the hearts and minds of the people of this region. Urdu and Persian literatures have flourished here and so to Kannada folk literature, which gave this region its indigenous identity. 3. This land carries with it a legacy of diverse educational experiments and experiences. It is the seat of two universities in the past –Anubhava Mantapa ofBasavanna and Mahmud Gawan’s Madrsa – both of which attracted intellectuals from across the country and abroad. It is also worth mentioning aboutSannati, an ancient Buddhist centre of learning, andNagavi Ghatikasthan. It is incumbent on the contemporary educational institutions in the state to take forward this tradition of knowledge. In this, I see a prominent role for the Central University of Karnataka. Being a new university, it can set its educational priorities to achieve the lofty ideals set by the earlier seers and educationists. 4. The Central University of Karnataka, from a modest beginning, has made tremendous progress in a short period of time. It has nine schools with sixteen departments and two centres, with many more in the pipeline. With student strength of twelve hundred, this University is proceeding in the right direction to mould the destinies of the youth of this region. It has through its policies played an assimilative role in terms of providing greater reach to higher education. Particularly, its commitment to women’s development by waving off fees for girl students coming from economically weaker sections is commendable. 5. On this auspicious occasion, let me congratulate you all on your achievement. I can see a palpable sense of joy in you. Today, youbid adieuto youralma mater which has been your academic universe for the last few years. Be confident in the education you were provided here. Be assured that you have been provided with the implements to shine wherever you go and flourish in whatever you do. At the same time in this moment of elation, you must comprehend the hopes and expectations that your near and dear ones, the society and the nation at large have from you. As bright young minds ready to start a promising career, you have a duty towards the upliftment of the under-privileged and the alleviation of burning problems of our society. I am confident you will achieve success and contribute to the development of our nation. 6. On the foundation of a robust education system, nations have from times past overcome poverty, social malaise and economic turmoil to push forward their productive frontiers. In ancient India, a thriving culture of knowledge generation and propagation existed. It was backed by globally-renowned seats of learning like Nalanda, Takshashila, Vikramashila, Valabhi and Odantapuri. These institutions were a melting pot for scholastic pursuits of learners far and wide. 7. The scenario is quite dissimilar now. Our institutions of higher learning lag behind many in the international rankings brought out by reputed agencies. For the last three years on different occasions, I have urged Indian institutions to adopt a more proactive approach to present their credentials better. A higher rank improves morale, enhances job prospects of students, and helps in attracting both quality faculty and meritorious students. It is a matter of great satisfaction that for the first time, two Indian institutions have figured amongst the top 200 universities this year. I hope other Indian institutions would follow suit. Nascent universities like yours through a sustained effort at better academic management can soon be in the reckoning. 8. With change comes progress. This truism applies to the education system as well. World-class education is feasible only with world-class faculty. Faculty development must occupy the top priority in our institutions. The theoretical framework of any discipline undergoes rapid change as new concepts continuously emerge replacing older ones. With the qualities of foresight and eagerness, our teachers can always stay abreast of the latest developments in their field. 9. In the context of teaching, we have to overcome the twin challenges of closing the vacancy gap expeditiously and also attracting meritorious people to this profession. A flexible approach to mitigate shortage of teachers is needed. Adjunct faculty from industry and research institutions can be hired. They would provide an industry orientation in the higher education pedagogy. Specialists from abroad could inject new ideas. The Global Initiative for Academic Networks (GIAN) is a welcome step in this direction. 10. Over 40 crore students are likely to seek education at different levels by 2016. Our education system has to gear up to meet the triple challenges of access, affordability and quality. This task is compounded by the fact that 30 crore youth have been envisaged for skills training by 2022. To my mind, technology-led models could offer a viable solution in the education and skills delivery landscape. For instance, massive open online courses (MOOCs) have come up in a big way since it first started in 2008. Leading universities of the world have applied this technology model to provide quality education to larger number of education seekers. Rich course content and flexible programmes, aided by innovative tools of evaluation and periodic classroom interaction in the form of Modified MOOCs can work well for a country like India where students are diverse in terms of educational attainments, socio-economic backgrounds and location.Interactive MOOCs can also power vocational training and improve delivery of skills knowledge. 11. The mobile phone technology can also act as an enabler for formal and vocational education. Skills training apart, education content from best institutions can be made available on mobiles. E-platforms cannot substitute classroom teaching but it can perhaps play a complementary role. ICT tools like the National Knowledge Network have to be used extensively for collaboration of ideas, knowledge and academic resources. 12. A developing country like India needs innovative solutions to issues in renewable energy, climate change, drinking water, sanitation and urbanization. It is incumbent on our universities to align their research priorities with these challenges. Our universities have to be the breeding grounds for creative pursuits and cutting-edge technology. They have to inculcate in their students a scientific temper and a spirit of inquiry. Research promotion at the under-graduate level could facilitate this objective. 13. Central universities are intended to be a vehicle for social transformation. They have to reach out to people in their region by disseminating knowledge, encouraging innovation, promoting environmental conservation and developing skills. They have to elicit the participation of talented local youth, increasing their employability and ushering in upward mobility of the deprived. (Which means: May all be happy, may all be free from illness, may all see what is auspicious, may no one suffer). 15. A good education system is one that can help develop social responsiveness in students. Ways should be devised to integrate student engagement with society in the academic framework. For instance, higher level students can be assigned to teach in government schools located nearby. It will help address the existing shortage of teachers at primary and secondary levels and also create a desire in them to enter the teaching profession. Students can also be deployed to undertake community-based projects. They can identify problems and involve themselves in research to find solutions. Measures like these would mould students into confident and purposeful human beings, who can through their conviction and own example inspire others. "We must become the change we want to see in the world”.